Dec. 6, 2016, 8:47 p.m. Which is why I think PR's should be allowed to vote. I would hazard a guess that most PR's value their countries Citizenship in addition to their Permanent resident status over the ability to vote. PS. If you read what I said, I never blamed the Canadian government for their situations. Dec. 6, 2016, 8:49 p.m.
well no, he didn't say that the govt of Canada prevents them from getting citizen ship. what he did say is that they'll lose their Dutch citizenship if they get CDN citizenship. you are right though that it's no guarantee the Dutch govt will take their Dutch citizenship away, but they may have a better idea of how often that happens. google says that if they have dual citizenship and reside outside of the Netherlands they will lose their Dutch citizenship. Dec. 6, 2016, 9:06 p.m.
PR requires you live in Canada for at least 2 years out of every 5 years, if not you can lose your PR status. Would a PR who is a foreign citizen and lives 60% of the time outside of Canada have the right to vote from outside of Canada? If so, that makes little sense to me. Dec. 7, 2016, 6:31 a.m. I have Japanese friends who made the choice to fully integrate and become Canadian citizens, and Japanese friends who view Canada as part of their life's journey, but wish to remain Japanese. I don't want the latter voting in our elections, period. They're good people, but you have to be a citizen to vote IMHO. Challengers typically believe that, above all, democracy should be responsive to citizens. They tend to be more skeptical of government and thus open to ideas that could enhance accountability of governments and give voters more control. They generally prefer governments that are decisive and are less likely to prioritize compromise with other parties. They usually expect parties to take responsibility for their decisions and for voters to have more ways to influence politics. Dec. 7, 2016, 7:33 a.m.
That's exactly why you need to be there! Dec. 7, 2016, 7:48 a.m.
Citizens have to live in Canada 0% of the time. I'm a dual citizen, Canadian and Dutch. I was born in Canada, have never had an address in the Netherlands. I can vote there if I want. Dec. 7, 2016, 11:04 a.m.
Another innovator, but I am all for online voting. It can be secured, we just have to figure it out. A chipped national ID card would be a good start. There is no reason we can't say "Let's do it. ", then work on it until we can agree on a system that has enough safeguards. Dec. 7, 2016, 11:31 a.m.
Just need to set up some sort of multi factor authentication. We manage to do everything from filing taxes to purchasing goods online without significant levels of fraud, securing online elections shouldn't be that difficult in this day and age. It should be an option at least for those of us who would be willing to register and set up the necessary authentication. Dec. 7, 2016, 12:07 p.m.
Dec. 7, 2016, 12:08 p.m.
Dec. 7, 2016, 1:15 p.m. Exactly. The tricky part is keeping it anonymous while still being secure. If you are willing to accept verification of your ID then that is half the battle. All I know is if we can get burritos delivered by drone surely we can sort out a way of securely checking a box via the internet. Isn't that what Translink did with the Compass card? Dec. 7, 2016, 1:36 p.m. If it's digital, it can be hacked. It may not even need to be hacked, there will always be persons or organisations with vested interests in election results. People are easily corrupted by money. 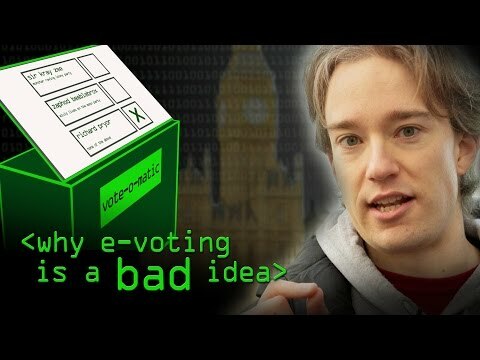 Backdoors have existed in voting systems in the past and there is no reason to believe they won't exist in new ones. The fraud could be so advanced that it would be very difficult to detect or find the perpetrator. Any security expert worth their salt would advise against voting machines / online voting. Even paper ballots seems too advanced. We should be chiseling marks into a stone obelisk. Dec. 7, 2016, 3:18 p.m.
Dec. 7, 2016, 3:20 p.m. But the stone obelisk could be substituted or tampered with as it's being transported to the Capitol! Too much potential for fraud. We'd best just make a giant pit in Saskatchewan, gather each and every voter and simultaneously cast coloured stones into it, we'll camp out and watch trained chimps (no worry about cash bribes there… though bananas would be strictly prohibited) organize the stones onto giant scales! Heaviest scale wins!